I’ve been making homemade biscuits for… well, forever, but they never were quite right. The biscuits usually turned out a bit too crumbly rather than tender. Adjustments in technique and ingredients still didn’t help. Then I found Paula Deen’s recipe. Modifications: Preheating the skillet with a glug of vegetable oil in the bottom makes for a deliciously crunchy biscuit bottom. I added a touch more baking powder for extra lift. Pour a glug of vegetable oil into a cast iron skillet. Place skillet in oven, and preheat oven to 425°F. Remove skillet from oven and place biscuits in skillet. Bake for 12 minutes or until golden brown. But we do have some new neighbors, and as I was scanning the pantry trying to come up with a yummy treat to take over, I remembered that my friend MG had tagged me in a recipe video for candy brownies awhile back. One quick Google search later, a modification of this recipe from AllRecipes was the winner. For the candy, I used a mix of Twix, Milky Way, and Three Musketeers. Ooey gooey delicious. Preheat oven to 400. In a large bowl, blend together the brown sugar and butter until creamy. Add egg and vanilla extract and mix until blended. In a separate bowl, mix together flour, baking powder, and salt. Add to bowl of wet ingredients and stir until just incorporated. Fold in candy pieces. Press batter into greased 8×8 pan and bake 20 minutes or until done. If you’re looking for a simple homemade recipe that’s super cheesy and creamy, this is the one. It might be Mena and Mamoo’s recipe, if they used recipes. What’s the secret? Fill a large pot with water; salt generously and bring to a boil. Add pasta and cook according to package directions, reserving 1 cup of the pasta water before draining. Return drained pasta to the pot, turn stovetop heat to low, and add Velveeta, butter, salt, and a generous amount of pepper. Stir in milk and continue stirring as Velveeta melts. Add pasta water as needed to reach desired consistency. For leftovers, add a splash of milk before reheating. Several months ago, some girlfriends and I got together for a freezer cooking party. Having attended several commercially-run events over the past few years, we decided to try our hands at creating our own menu and shopping list. This allowed us to share ingredients and accommodate a variety of allergies and preferences. And I must say, the effort was well worth it! This recipe was intended for the crock pot, but Husband and I are picky about chicken meals. Unless you plan to shred the chicken for tacos, for example, whole chicken breasts can come out a bit rubbery after being in a slow cooker all day. So for an easy Monday meal, I defrosted this freezer bag recipe and pan-seared the chicken in a seasoned steel skillet. This was so delicious served over steamed rice with a quick pan gravy. Place all ingredients into a gallon-size freezer bag, Mix well to ensure chicken is coated, then place in freezer. The night before serving, move the freezer bag to the refrigerator to defrost. For slow cooker preparation: cook for 5 hours on high, or 7 hours on low. For pan-seared preparation with gravy (optional, but highly recommended): Add 2 Tbsp olive oil to pan and turn heat to medium-high. While pan heats up, use meat tenderizer to flatten the chicken breasts until they have even thickness throughout. Sear chicken for 4 minutes on one side. Flip to other side and cook for another 4 minutes or until cooked through and juices run clear. Remove chicken from pan. With heat still on medium-high, add 3 Tbsp flour to the pan and stir quickly with a fork or whisk until absorbed. Slowly add in 1 cup milk while stirring, continuing to stir until gravy reaches desired consistency. Salt and pepper to taste. Some nights you feel like getting fancy, and other nights it’s a miracle that you don’t give up and order pizza. This recipe was created on one of those “other” nights. Sometimes it’s fun to grab some random items from the freezer and fridge and hope for the best! I saw the meatballs in the freezer and immediately thought of buffalo BBQ sauce, so I perused several recipes online before throwing this one together. It’s a bit too spicy for kids, but Husband and I like spicy food and this did the trick for sure. My made-up recipe turned out super yummy, and has practically zero prep time! Served with fries and green beans, we had a meal in minutes. Preheat oven to 350. Spray a deep baking dish with cooking spray and place frozen meatballs in the dish. In a small bowl, mix together remaining ingredients until blended. 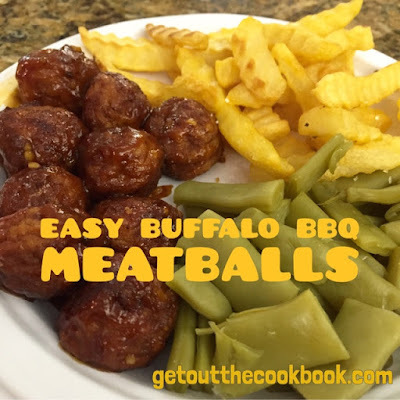 Pour sauce over the meatballs and stir until all meatballs are coated. Cover with aluminum foil and bake for 20 minutes or until hot throughout. One time (yes, just one time) I made Indian food at home. I thought the chicken curry was yummy, but it stained my black spatula yellow for weeks, and Husband complained about the smell in the house for just as long. This is also how I learned that he had a college apartment that was above an Indian restaurant, thus suppressing any appetite for Indian food he might have had. None of this stopped me when I saw a friend post this recipe on Facebook. It’s bread! And bread is the best. I’m so glad I tried this one out. Super easy, fun to do, and incredibly delicious. Warm buttered bread fresh out of the oven just can’t be beat. The whole family gobbled it up! Looking forward to my next batch already. Substitutions: No substitutions on ingredients, but I did tweak the process a bit to make it even simpler. I put the initial ingredients into the bread machine bowl, waited 5 minutes, then added all the remaining ingredients directly into the bread machine bowl as well. Adapted from original recipe at Food.com. In the bowl of your bread machine, combine warm milk with yeast, butter, and 1 tsp sugar. Wait 5 minutes. Add the other 1 tsp sugar and all remaining ingredients into the bread machine bowl. Set the bread machine to the dough setting and let it run through the complete cycle. When the bread machine has almost finished the dough cycle, preheat your oven to 500. When bread machine cycle is done, take dough out and separate it into six equal sections. Using a rolling pin or your hands, flatten dough out to ovals about 1/3 inch thick. When oven has pre-heated, place rounds on pre-heated baking stone or heavy baking sheet. Bake on top shelf of the oven for 1-3 minutes, watching carefully throughout; the naan should start to puff up like a balloon. Switch the oven from bake to broil for an additional minute and broil until the top starts to brown. When brown on top, remove from oven and cover with a towel while you finish baking the remaining loaves. 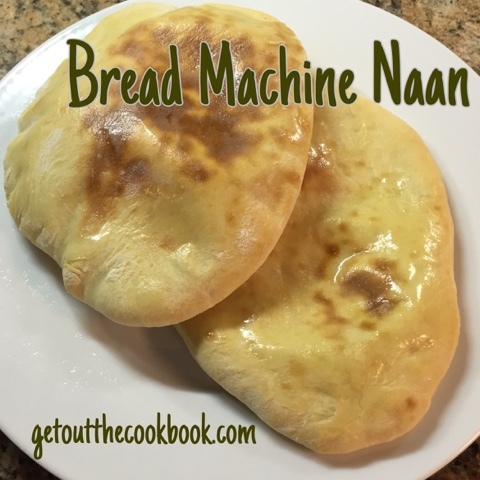 Brush the warm naan with butter before serving.